APPLY SURF AWARENESS AND SURF RESCUE SKILLS - (PUASARO12C). Enquiries to Surfing Tasmania 0429891102.New courses will be posted under the EVENTS link. RENEWALS - ACCREDITATION FOR COACHING. YOU MUST ALSO RENEW YOUR SURFING TASMANIA MEMBERSHIP ($55 annually) Process ONLINE at Surfing Tasmania website...SEE BELOW. Please note you need complete and forward copies of 7 forms/certificates; PRINT the Reaccreditation and Code of Ethics forms opposite in the sidebar.You also need to provide evidence of your current certification for: Surf Rescue ( 2 UNITS), Surf Life Saving Tas offer teachers the special accredited ASIDE surf rescue award;see dates, http://www.slst.asn.au/training-education/aquatic-safety-in-a-dynamic-environment-aside/ Community Surf Bronze, other), First Aid Certificate, CPR Certificate and Working with Children Card. These are the specific units required. Complete the form/s as required. 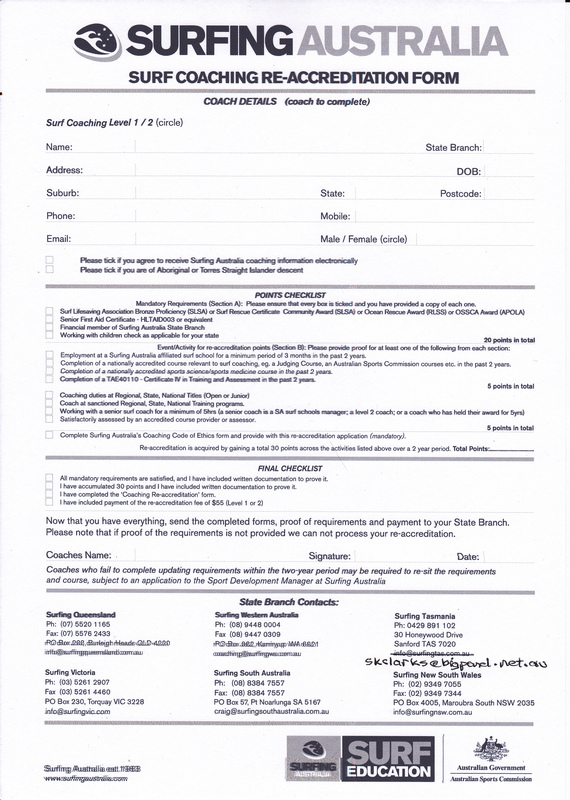 NOTE the Coaching Re accreditation and Coaches Ethics forms must be completed and forwarded with required 5 Evidence/Copies forms to: Surfing Tasmania, Shayne Clark, 30 Honeywood Drive, Sandford, Tasmania 7020, or emailed, as below, with the required payments completed online for your application to be completed. NOTE: As of July 1 2017 the entire reaccreditation process is completed ONLINE. STAS no longer issues individual receipts, invoices or accepts cheques etc.RECEIPTS are automatically issued upon online payments. COACHING LEVEL 1 OR 2. Get involved and get qualified by becoming a Surfing Australia accredited surf and/or SUP coach. The following courses are the only courses available in Australia that are recognised by the Australian Government (through the Australian Sports Commission) under their National Coaching Accreditation Scheme. All of our courses are also recognised by the International Surfing Association (ISA) and are the required qualifications in every surf school in Australia affiliated to Surfing Australia - the National Governing Body for the sport of surfing. State Branches conduct regular Level 1 Surf Instructor Accreditations throughout the year. For details on these courses contact the relevant State Branch or check out courses being conducted around Australia on the left hand side of this page. To obtain the Level 2 Surf Coaching Accreditation, you need to hold the Level 1 Surf Instructor Accreditation as a pre-requisite. Courses are conducted by the National Branch several times a year. Course dates will be listed on this page and application forms can be found under the "Documents" tab. State Branches conduct regular Level 1 SUP Instructor Accreditations throughout the year. For details on these courses contact the relevant State Branch or check out courses being conducted around Australia on the left hand side of this page. This module is designed to be utilised as an extension of the current Level 1 & Level 2 Surf Coaching Courses, up skilling accredited coaches by demonstrating the competencies required to effectively teach the beginner skills of Stand Up Paddleboard (SUP). Within the module candidates have the option of completing an enclosed flat water accreditation or a beginner surf SUP accreditation, so they have the flexibility to operate in either environment depending on their circumstances. On completion of these requirements your Surfing Australia Surf Coaching accreditation will be endorsed for either enclosed flat water or SUP surf on the SA database and a new coaching card will be issued. The RPL/RCC Assessment is carried out when the applicant provides evidence of their competencies; completes an RPL/RCC application form; and forwards this for processing as detailed on the form.